Soda bottler Harold Honickman (middle, in blue shirt) sits before a pro-soda-tax sign at Wednesday's contentious hearings in City Council chambers. It was the last-minute detail heard 'round Philly’s soda tax-debate world. 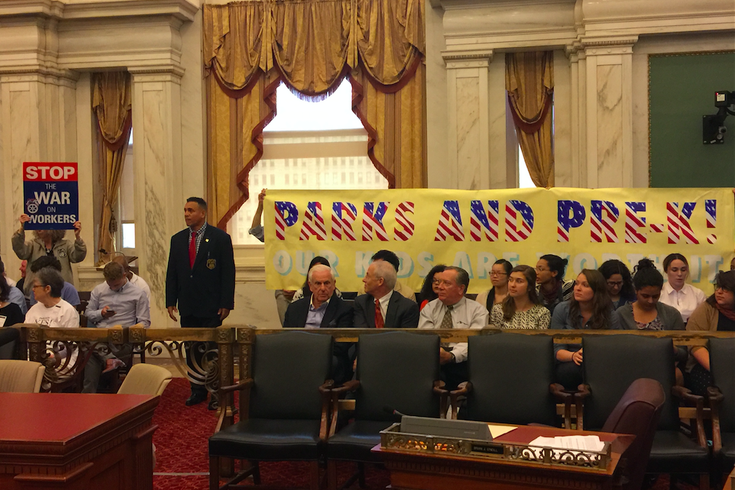 Before City Council’s Committee of the Whole offered support for Mayor Jim Kenney’s sugary-beverage tax proposal on Wednesday night, word came from finance director Rob Dubow that a portion of generated revenues would also go toward the city’s general fund. Eyebrows were understandably raised in Council Chambers and beyond to the cry-foul tune of “we thought this was for the kids”? This isn’t the first time that the general fund-balance issue has arisen, but never to the extent that it arose during the heated climax of the debate itself. While it flew under the public radar, the March proposal included $19 million heading that way over the course of five years, but none in Year One or after Year Four. The pro-initiative group, Philadelphians for a Fair Future, also referenced it in a Thursday morning press release regarding the vote. "We ask our partners to contact their respective council members to thank them for moving the legislation forward and to urge them to ignore the desperation tactics of the soda industry and vote again on June 16 to finalize its passage," read the statement. Through a spokesman, Danny Grace, secretary-treasurer of Teamsters Local 830, said he couldn't disagree more. "Several council members told me that the first they heard of the commitment of $30 million in soda-tax revenue for the fund balance was Wednesday at 4:30 p.m., and they were not happy about it," he said. "All they'd heard from the administration was that the tax was all about the kids. We now know that wasn't true. It was a classic bait-and-switch." Obviously, this issue will be a major talking point at today’s council meeting, where legislation regarding the general fund balance may be introduced, and beyond. PhillyVoice will keep you updated on how it progresses.